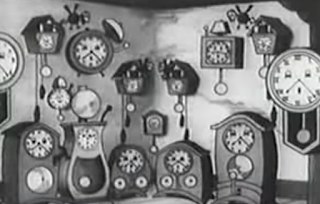 Check out this cartoon created by Disney in 1933 called "The Clock Store". There is another clock store video using modern animation. Called "The Tick Tock Tale". They are both worth watching. The Disney video like most cartoons of that era is a little edgy and violent where there current video is not as edgy but has its moments of surprise. Preview alert....the pants of the green alarm clock at 75% off.